Vegetarians have a place... just not in this kitchen. 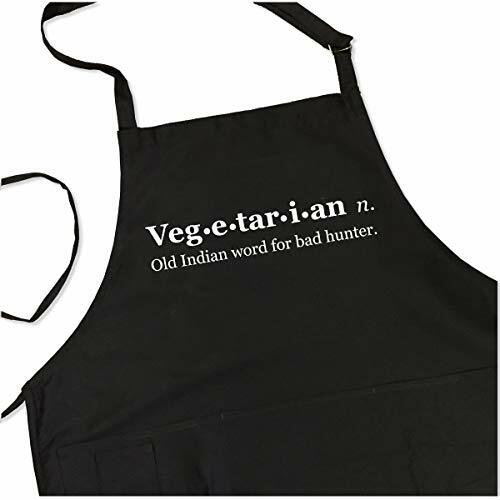 For the cooks that love their meat. Made from the highest quality materials available. This apron is a blend of 65% Polyester and 35% Cotton. Twill 70z fabric. You can easily adjust the size of the neck with the built-in neck slide. This apron features long ties that can be used to secure the apron in the front or the back. With three large pockets and 1 small utility pocket you will always have your tools of the trade available when you need them. Whether you are in the kitchen, at the grill or in your shop, you know you can rely on the quality and durability of this apron. Machine washable. WE GUARANTEE THIS APRON WILL FIT. If it doesn't, you'll get a full refund. Designed to fit anyone 4'1" - 7'1" and almost all waist sizes (15" waist to 60" waist). A great gift idea for men, dads, grandpas and sons that they will enjoy when grilling, cooking and gathering with friends. MONEY BACK GUARANTEE - 100% satisfaction guarantee. Professionally printed BBQ apron. If you have any questions about this product by ApronMen, contact us by completing and submitting the form below. If you are looking for a specif part number, please include it with your message.